Stay a While, Won't You? So every once in a while, my husband likes to surf youtube for snippets from the ultimate Bollywood hit of the 70s, Sholay. He does have it on DVD but youtube must be more convenient since the DVD only seems to be gathering dust. Hmmph! Anyway, he knows the dialogs backwards and can recite them in his sleep, if he has to. Medha watched in stunned silence. Once the song was over and she had regained her composure, she asked her father: Daddy, now tell me the real meaning of Mehbooba. What's that green stuff? It's disgusting. What's cauliflower? Why is it yellow? That's just gross. That has been the general response in the Finer Diner, the lunch cafeteria at school, when Medha opens her lunch box. The disgusting green stuff is usually cilantro chutney or baby spinach. The result? She stopped taking chutney-cheese sandwiches – which she simply adores – for lunch. The stinky stuff? It could be cheese ravioli in delicious organic pasta sauce. Or it might be spicy red lentils. Yeow? For macaroni and cheese with a good dose of ketchup. And, yes, some kids don't know what cauliflower is. Being ostracized in the cafeteria, or having your peers tell you that your food is disgusting, is not the best place to be for a 3rd and 4th grader. Especially for one to whom retorts come much after the fact. Soon, all she would take for lunch was a PBJ sandwich or a bologna sandwich or sandwiches with deli meats like smoked turkey, chicken or honey ham. The high sodium content in the meats bothers me as well as the fact that they are highly processed. PBJ, after a while, does get boring. Lunch boxes like these won't do either as we need the food to slide down the throat after having gone through minimal chewing action. Several times a month, I try to sneak in some Indian or spicy food in her thermos and the conversation later that evening is always the same diplomatic exchange: It was really good, Mumma! But it is more suited for dinner, don't you think? 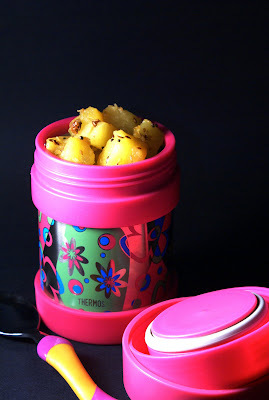 The only Indian food that she will take willingly in her thermos is sans asafetida, turmeric, ginger or garlic. Yup, potatoes. Yup, Til Aloo. I call it the last bastion of Indian food in her hot lunch menu. It's very easy to make, does not stink, is not green or yellow in color and is not cauliflower. She takes a plain butter sandwich along with it. Dice the potatoes as evenly as possible into 1 inch pieces. Heat the oil and add mustard seeds, cumin seeds, sesame seeds and red chillies. When the seeds pop and crackle, add the potatoes and salt. Mix well so that every cube of potato is coated with the tempered oil. Cook over medium heat till the potatoes are crispy and have browned slightly. Mix in a folding action occasionally so that the potatoes don’t get scorched or burn. Pour the lemon juice, mix well and serve immediately. Til Aloo goes really well with Malaysian parathas which can be found in the freezer section of most ethnic grocery stores. The original recipe, from Jyotsna, requires the potatoes to be ¾ cooked. Sometimes the potatoes are just too new and once they have been partly cooked, they don't cook completely thereafter. It works better for me if I boil the potatoes the day before or several hours earlier. When cooled, they are easier to handle and dice into a uniform size. When I make this for a dinner party, I prefer to reheat the potatoes in a skillet to revive the crispiness and I add the lemon juice just before serving. Reheating in the microwave or oven is easier but you lose the pleasure of biting into those crispy bits of potato. The til aloo in the picture looks yellow because the potatoes were that color. No turmeric powder was harmed in the making of these potatoes. I know I've been gone a while and you want to know what I have been up to. Life has been brimming with excitement, as always. But, hang on. 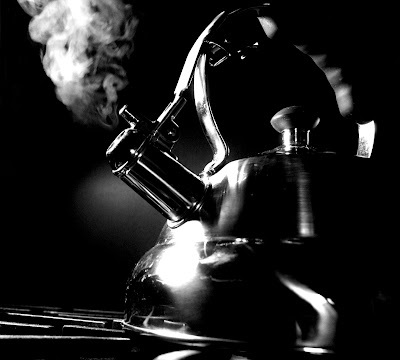 Let me put the kettle on, first. There! So much better! A good cup of tea must be shared between friends, no? Let me get the teapot ready because I hear the tea kettle whistling. 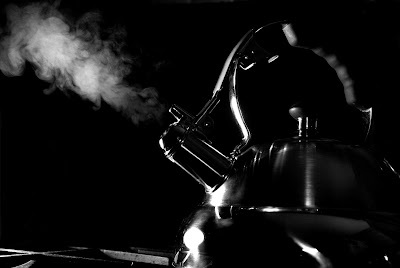 Steaming - my entry as a judge for Click - Metal. Get on with it, you say? In a minute! 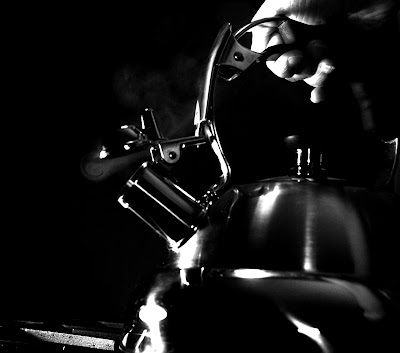 Let me pour the hot water into the teapot first. Ah! Much better. Now sit back and enjoy that cup of tea and tell me which of the three pictures you like best. As usual, I can't make up my mind about which picture to send to Click. Not that it matters because I am a judge for the March event. But it's always nice to get your opinion. Me? I like them all but I do lean most towards the third one for many reasons. I love the little swirl of steam escaping from the spout, right under the whistle, and I also like to think that the picture represents me: ready to come back! So put your thinking caps on and let me know. Update: The people has spake! #2 is it!